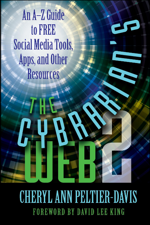 The Cybrarian's Web 2, By Cheryl Ann Peltier-Davis | Information Today, Inc.
"The Cybrarian's Web 2 is a really useful, at-your-fingertips resource covering some cool online tools, apps, services, and resources. ... this second installment focuses on some lesser-known but still extremely useful tools that can help librarians in the workplace and beyond." Volume 2 of Peltier-Davis's popular guide presents 61 more free tech tools and shows how they can be successfully applied in libraries and information centers. Written for info pros who want to innovate, improve, and create new library services, Volume 2 combines real-world examples with practical insights and out-of-the-box thinking. You'll discover an array of great web resources and mobile apps supporting the latest trends in cloud storage, crowdfunding, ebooks, makerspaces, MOOCs, news aggregation, self-publishing, social bookmarking, video conferencing, visualization, wearable technology, and more—all tailored to the needs of libraries and the communities they serve. If you're looking for expert guidance on using free content, tools, and apps to help your library shine, The Cybrarian's Web and The Cybrarian's Web 2 are for you.